Since I published my research on cognitive enhancement drugs in the workplace, I’ve been looking for ways to continue my research and share what I’ve learned. With email lists making a bit of a comeback over the last year, I decided to create a curated email list. Much of my inspiration came from the work Joe Crobak has done with Data Eng Weekly (formerly Hadoop Weekly) and I’ve stolen liberally from him to get started. And feel free to submit links, news, events and journal articles to me via Twitter. Should Cognitive Enhancement be Compulsory? Research supporting the use of cognitive enhancement in healthy people is, at best, inconclusive. But it’s easy to imagine a scenario in which some type of cognitive enhancement is effective at maximizing executive function and working memory with little to no negative impact. This scenario is admittedly far-fetched, but it introduces interesting questions: If cognitive enhancement methods are effective, should certain professions be required to use them? This is the question posed in a 2014 research document. As the authors point out, progress in science and technology has already impacted countless jobs and created new obligations to use practices and methods that improve outcomes. The counter argument is that these innovations, like antiseptics, are external. They don’t force a professional to alter his or her brain chemistry to possibly deliver better outcomes. If cognitive enhancement were safe and effective, should those enhancements be used in every situation? Would you want a cognitively enhanced surgeon or pilot? 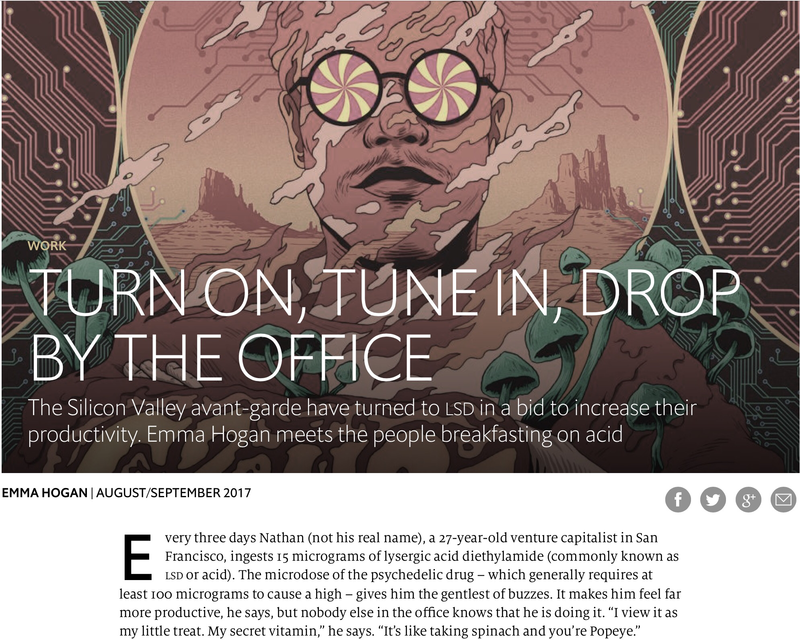 1843, a spin-off publication of The Economist, recently published an article on Silicon Valley’s LSD microdosing trend. As you’d expect from The Economist, it was an even-handed treatment of a controversial topic. At least, it would be controversial if more people knew about it.